UPTOWN — What are homeless people in some parts of Chicago allowed to have and what's banned? The city is spelling out the terms in a detailed memo being distributed to people living under Wacker Drive and around the Wilson Avenue viaduct under Lake Shore Drive. The policy was negotiated with members of Chicago Coalition for the Homeless after a complaint filed last year. It dictates what "Personal Portable Possessions" can be kept, what can't be kept and how much notice city workers must give before collecting items and throwing them away. The homeless rules for people living under Wacker and near Wilson include a limit of five blankets per person, although 10 blankets are allowed between October and April. People there can also have a maximum of two pairs of shoes or boots, two coats, three bags or suitcases and one sleeping bag (two in winter). What's prohibited? Tents, mattresses, appliance boxes, shopping carts, couches, fire pits and potted plants. The rules also cover the city's responsibilities when workers clean the streets in the designated areas, including a 24-hour notice of an impending cleaning and a pledge not to throw out unattended "items of special value," including "important personal documents, medication, eyeglasses, or money, if readily visible." Although homeless advocates helped negotiate the rules, some advocates say they are being improperly applied to homeless living in other parts of the city. A group of about a dozen people, who have been forced out of the Lawrence Avenue viaduct under Lake Shore Drive were one such group. They've been moved to a nearby lakefront embankment that can be seen by drivers on Lake Shore Drive. The city is attempting "to criminalize the homeless, in my opinion," said Patricia Nix-Hodes, the Chicago Coalition for the Homeless's director of the Law Project, noting the group was unaware of the homeless moving from under the viaduct in Uptown. Police officials did not respond to questions about the move. The Department of Family Support Services also would not comment on the situation. One of those moved from the Lawrence Avenue viaduct, Aniceto Valdez, said the group was told by police that if they didn't leave, they would be ticketed. About two weeks ago, they were allowed to erect tents on the embankment at night, he said. "The viaduct is better, but they don't want us there. We have to just roll with the punches," said Valdez, 49. "But, why do they want to make something that's bad even worse? C'mon, please. They could at least give us a break." Valdez said he had been living under the viaduct for about three months. Before that, he was employed and living in Rogers Park, he said. "I lost my job, that's how I lost my housing. Now I'm doing whatever I have to do to survive, and it's hard when police are bothering you for every little thing," he said. Valdez said that allowing the homeless to live under the viaduct makes it easier for social service agencies to hand out food. Also, the homeless can get handouts from people walking to the beach, he said. The loss of the viaduct, coupled with the new rules — some in the paper handout given to the homeless and some Valdez said were delivered verbally — will make for an even more unpleasant winter than they were already planning for, he said. Other rules given by police, Valdez said, include making the homeless take down their tents by 9 a.m. at their new site. "These really aren't that easy to take down," said Valdez looking at the cloth canopy he's forced to call home for the moment and shaking his head. "The rules just keep changing and it's getting colder." Ald. Harry Osterman (48th), who has worked to move the homeless off the street and into shelters, could not be reached for comment for this story. 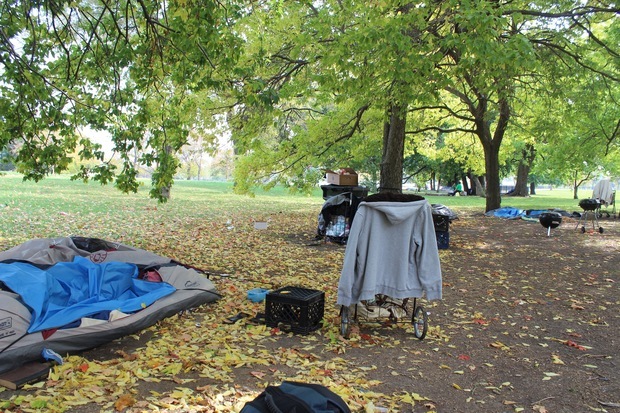 Nix-Hodes referred to how the city cleared the viaducts of homeless along Lake Shore Drive ahead of this summer's Mumford and Sons concert at Montrose Beach. "When the concert was going on, the city's rationale was that it was a special event and a large number of people traveling through the viaducts," Nix-Hodes said. Now, she said, it appears authorities just want the homeless to disappear. "Pushing people from [Lawrence] does nothing to resolve the issue," she said. The goal "should be getting them out of this situation, rather than pushing them from place to place." The new area for those removed from the Lawrence viaduct "seems clearly less safe for people." 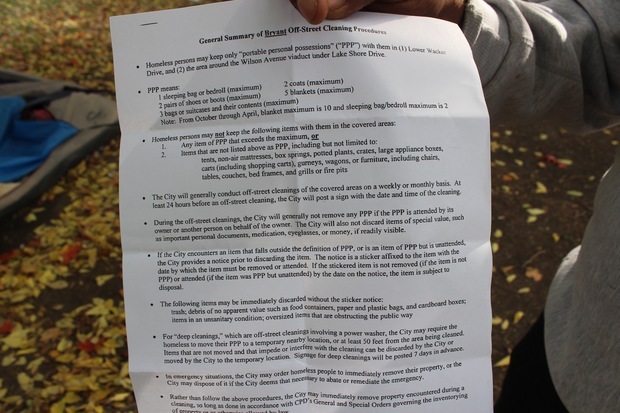 Authorities have been handing out summaries of the agreement but the coalition has talked to the city about distributing the full policy, Nix-Hodes added. "Some of the information people are getting gets confusing," she said.